Play the ball where it lands. 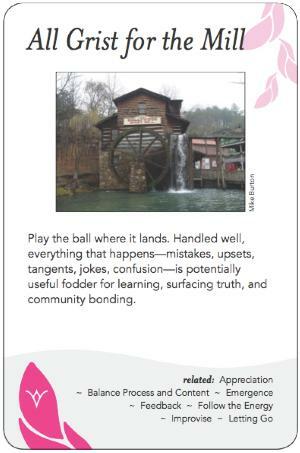 Handled well, everything that happens--mistakes, upsets, tangents, jokes, confusion--is potentially useful fodder for learning, surfacing truth, and community bonding. 1. As Open Space puts it "whatever happens was the only thing that could have happened", that, regardless of apparent (lack of) productivity or results, the process and all that it entailed were/are necessary to produce the learning, understanding, appreciation and achievements of the group. 2. It is essential that the facilitator draw on all available information, both present (including body language and other non-verbal information) and through appropriate research on past context and applicable lessons from the past. This includes awareness by the facilitator of her/his own state of mind, emotions and intuitions. It's all "grist for the mill". This pattern thrives best in situations where groups are supportive of a "beginner mind", and where there is no shame and no blame. Mistakes and inarticulateness are not made personal, and appropriate accountability and clear boundaries help groups and individuals stay healthy and balanced through the learning-from-mistakes process. It is equally important that the facilitator and group come prepared with background knowledge of the context of the current issue, including social, political and emotional aspects, and knowledge of what has worked/not worked in the past and in similar situations elsewhere. Some of the "grist" for the mill comes only from good advance research. Facilitators are well positioned to rolemodel fearlessness and an openness and willingness to embrace the process of learning. It is the flexibility in attitude of a facilitator that makes this pattern often work well. For example, a group may be progressing along when a charged statement is made and people get tense. It is here that a graceful macro vision from a facilitator answering the question, "what are we learning", can benefit the group. Facilitators need also to be aware of what is not being said, but is apparent from body language and other non-verbal communication. What is most beneficial for the group to work on may be exactly what the group is avoiding. Finally, it is important that the facilitator be alert to what s/he is feeling, perceiving and intuiting. The facilitator is integral to the group process and her/his own presence, conveyed verbally and non-verbally, is essential to and strongly influences that process. Beware chronic issues. What is causing the group to be unwilling to learn from this pattern? Patience and tolerance is key to this pattern, and a vibes watcher may be useful in monitoring the situation. Don't ignore or glibly blow off trouble-spots that come up, whether voiced or tacit. Clearly acknowledge them and talk them through. Include your own concerns. Be empathetic and take care not to make anyone feel ashamed, foolish, or judged. This pattern requires trust in the wisdom of the group, and insight in the moment to see the lessons. If the group lacks trust in each other or in you (the facilitator), the "mill" will grind to a halt. Be aware of time constraints. Some "grist" can take a long time to process. According to employee Elph Morgan, Zingerman's Deli in Ann Arbor, Michigan periodically gives out an award for the best mistake. Their aim is to bring mistakes out into the open so that everyone can learn from them. "I have not failed 10,000 times. I have successfully found 10,000 ways that will not work." Thomas Edison's response to the question of how he felt about his failure to make a light bulb. There is a proverb about a week-long pottery competition between two groups. One group was offered a prize for producing the single best pot produced by anyone in the group. The second group was offered a prize for the person who produced the most pots. At the end of the week, all of the finest pots had been produced by the second group, because they had learned so much from all the mistakes they had made producing hundreds of pots.